Less Stress: Adapt to Life With Adaptogens! If you asked someone what the benefits of adaptogens were, they might answer that it just depends on what you need. Adaptogens are an amazing class of botanicals that help your body cope with different types of stress in order to return to homeostasis. They are able to produce the effects your body needs by nourishing your adrenals – the little triangle shaped hormone centers that sit on top of your kidneys and regulate your cortisol. The name says it all… adaptogens help your body adapt – whether it’s a cold you’re fighting off, fatigue from lack of sleep, or anxiety and worry. These are great herbs to have as a part of your well-being toolkit and although they take some time to kick in and master the regulation your system needs, they are well worth the commitment. We’re sharing a few of our favorite root adaptogens with you that can easily be added to your daily regimen. One of the qualities of adaptogens are that they have little to no side effects and are good for the totality of the body. However, please consult your doctor or one of our acupuncturists to understand dosing and any possible contraindications. Cheers to less stress! Asian Ginseng (Panax Ginseng): One of the best known medicinal herbs in chinese medicine, this root tonifies the qi (energy), calms your shen (spirit), and strengthens the spleen and lung. This bitter, sweet and warm root can be decocted or ground into a powder and mixed into hot water. This one rejuvenates! Eleuthero (Eleutherococcus Senticosus): Also known as Siberian Ginseng, this adaptogen has been used for centuries in China, Russia and Korea. In Chinese medicine, it is known to invigorate the qi (energy), strengthen the kidneys which are your vital energy source, and help with sleeplessness. It also relates to the spleen and heart meridians. It is pungent and energetically warming. This one is a great all around balancer! Ashwagandha (Withania Somnifera): Another root that has been used for thousands of years, Ashwagandha is revered in Ayurvedic medicine as a way to longevity and vitality. 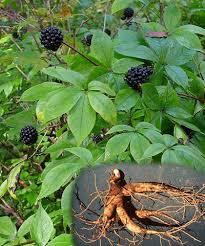 It is the Indian Ginseng. Ashwagandha is a grounding and nourishing herb that can help calm nervousness and stabilize mood. Known as a nerve tonic, it is exceptional for people who are over-worried or over-worked. If you buy this powdered, it can be mixed with warm coconut milk with an addition of honey and clarified butter to make an incredibly soothing elixir. Rhodiola (Rhodiola Rosea): One last root that has incredible benefits… Rhodiola is an endurance and energy powerhouse. In Asia, it is considered especially helpful in winter months as it helps with fatigue and decreased energy. Rhodiola can strengthen the nervous system and is uplifting. It is a very bitter and astringent root but can be taken as a tea or a tincture. This is one for stamina! This entry was posted in Acupuncture, Ayurveda, Chinese Medicine, Earth and Air Wellness, Herbal Medicine, Nutrition, Pleasant Hill, Seasons, Wellness. Bookmark the permalink.